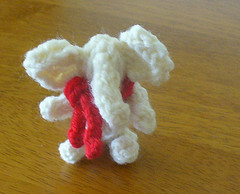 This elephant was my very first try at knitting a stuffed animal. (Perhaps it would have been a good idea to try making one from someone else's pattern first, but I think he turned out adorably anyway!) He's so small - only about two and a half inches high - and very quick to make. I used scrap yarn from my basket - you can use pretty much whatever you like. A great idea for those little ends that are left over, and perfect for kids, last minute gifts, ornaments, or just something to knit in between bigger projects!